The Austrian capital has always been dignified, but there's a thick layer of whipped cream around almost every corner. Its baroque architecture, art galleries and museums, rich musical heritage and cafés and cakes have been magnets for tourists since the days of the Grand Tour. 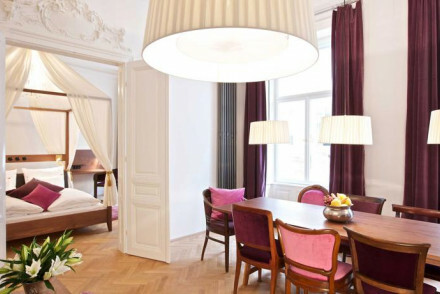 Our selection of the best places to stay in Vienna varies from the Hotel Sacher, an institution where old world charm meets modern luxury to the Pension Suzanne, a family run guesthouse with superb service and an unbeatable central location. If it's an apartment you're after, check out the choice with our online partner, Booking.com. Part of the city's appeal is its compact centre ('innere stadt'), which forms the 1st District. All the sights, restaurants and cafés and best places to stay in Vienna are within an easy walk. 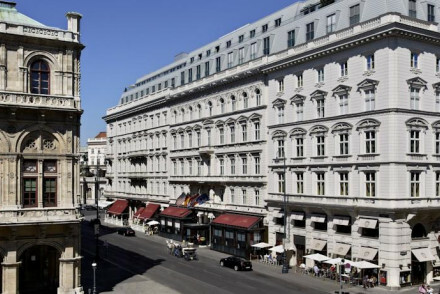 The medieval city is contained by a broad horseshoe-shaped road of 19th-century palaces, the Ringstrasse, where all the grand old hotels are found. Although a 1st District address is plum, the neighbouring districts, such as 4th, 7th and 8th, are still convenient and the hotels often better value. 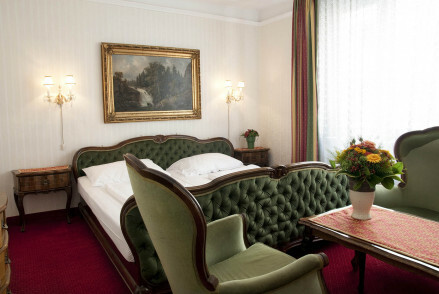 Viennese hotels are, almost without exception, well-run and pristine (even the most modest pension has good quality linen), but many are decorated in an oppressive Biedermeier style. 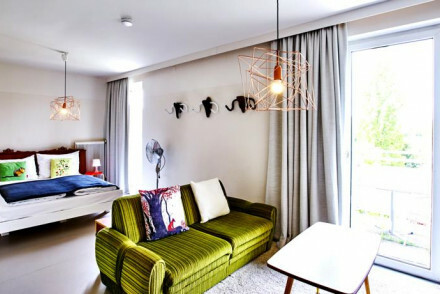 We have tried to ferret out the elegant ones, as well as recommending a number of fresh, contemporary boutique hotels. The Christkindlmärkte always draw crowds when, from the end of November to Christmas, little huts spring up on streets throughout the city, selling presents, food and warming Glühwein. 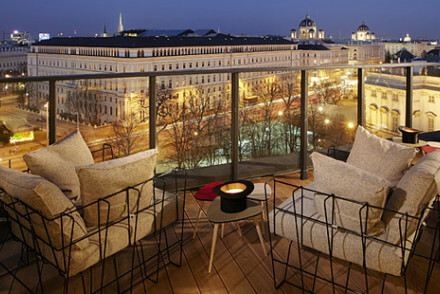 The city becomes a magical destination at this time of year and the best places to stay in Vienna get booked up well in advance, so get organised and plan well ahead. Its popularity has continued to grow and now, with budget airlines flying directly to the city, and to nearby Bratislava, Vienna has never been cheaper or easier to get to. 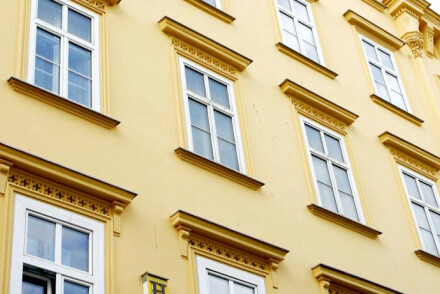 The best places to stay in Vienna reflect this with an increasing number of properties popping up to suit even the strictest of budgets. 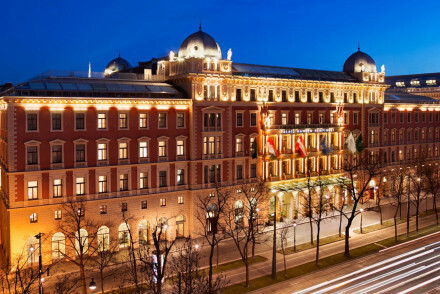 The Grand Hotel Wien has been a Viennese hub since the early 20th century and still exudes class and style. The Hotel Imperial, Vienna's grand dame, opened its doors in 1873 and is still in fantastic condition with massive suites and marble everywhere! An alternative to these old faithfuls would have to be The Ring a new "casual luxury" hotel, all slick style and cool unfussy rooms. 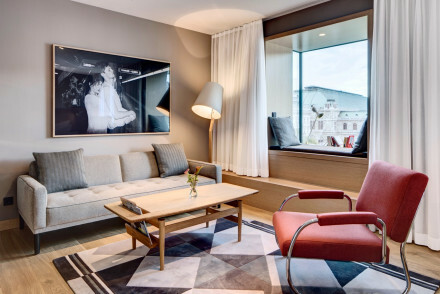 Our pick of the best contemporary places to stay in Vienna includes the Hollman Beletage - hard to find, but persevere, it's worth it! Do&Co a chic property with the best location in town and fresh modern architecture and design. Alternatively check in to the Altstadt. This hotel is just outside the Ring, but offers a great mix of styles from classic to avant-garde and houses the owner's stunning art collection. A good choice for those trying to save their Euros is the Pension Nossek, a traditional and great value guesthouse with a superb central location. Take note it's hugely popular, so book well in advance! Boutique, budget and very central the charming Saint Shermin is a real catch. 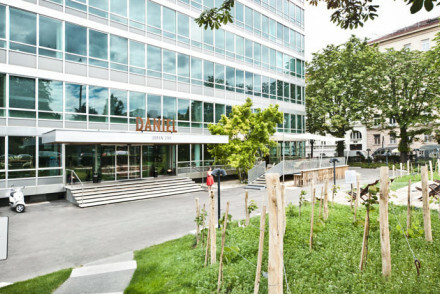 For something a little different from Vienna's usual grand interiors try Hotel Daniel, Vienna; it's chic, minimalist and environmentally conscious. 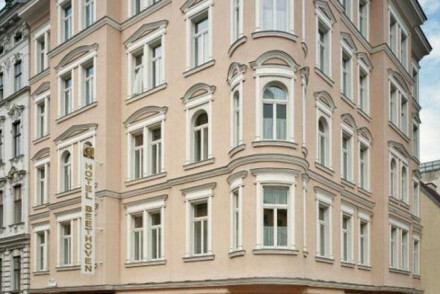 Hotel Kartnerhof is a great central choice for those on a budget. Small doubles or twin rooms start from as little as €109. 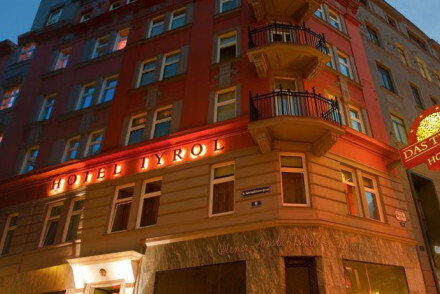 Konig Von Ungarn, a classical style hotel ideally located very close to St Stephens Cathedral in a 16th century building. Palais Coburg is another good foodie choice. It's a five-star establishment with two Michelin starred fine dining at Silvio Nickol. If you've decided that you'd prefer a city centre apartment, then we recommend you check out the wide range with our online partner, Booking.com. Fly to Vienna International Airport located just 18km from the city centre. Vienna is well connected by train, so easily reachable from many major European cities and numerous destinations across Austria. Vienna is warm and moist in summer, but come winter it dries out and drops below freezing. This variation of temperature is apparent during a single day too, with summer maximum temperatures around 30°C during the day, but dropping to around 14°C at night. June is wet, but the showers are short, with July and August still expecting some rainy days. But summer is also the sunniest time to visit, so it’s still the most popular. Autumn is fresh and mild and very pleasant, and spring tends to warm up quite quickly. It’s cold, but visiting during the Christkindlmärkte, which runs from the end of November until Christmas, is quite magical! or please feel free to contact one of our friendly gurus for advice. Alternatively take a look at all our recommendations in the equally historically rich 'neighbouring' Bratislava. 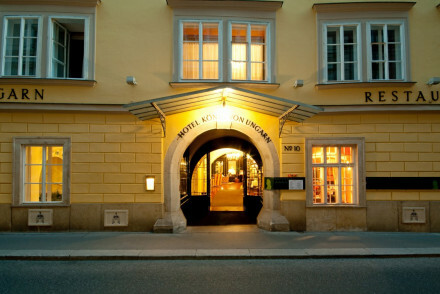 A boutique bed and breakfast hotel in the heart of Vienna with a personal atmosphere and welcoming staff. A home away from home with large rooms and everyday comforts. Close to lots of local bars and restaurants, a good spot to explore this culture filled city and great value too. A refreshing hotel. Minimalist, earthy, and focused on saving the environment. All white rooms speckled with neutral colours, fantastic bakery and restaurant, lovely terrace, beehives on the rooftop and vespas to rent. A modern traveller's dream and great value - but think Green Peace hip. Sights nearby - 15 mins walk to the city centre. Schloss Belvedere and the Botanical Gardens are close by. 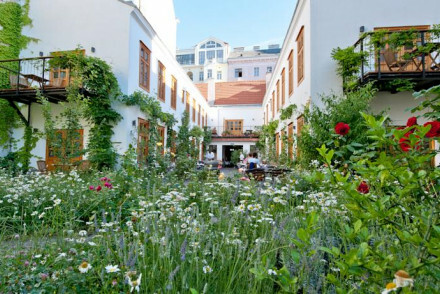 A trendy hotel and social enterprise in leafy Prater park. Staffed by 2/3s refugees you'll be sure of a fascinating cultural blend. Contemporary design throughout with an emphasis on art. A chic salon is perfect for meetings both business and social. Easy access to the city centre. Inspirational! City Style - Both an exciting and innovative social enteprise and a uber-trendy hangout hotel! Local exploring - Located just 15-minutes from the city centre and its many attractions. Sights nearby - Be sure to check out the impressive Baroque Schönbrunn Palace. 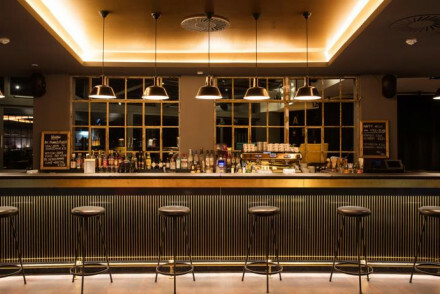 A sleek, modern hotel in Vienna's trendy 7th district. 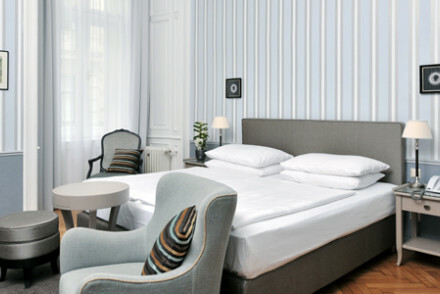 The bright white rooms are spacious and comfortable and those with attached balconies have beautiful views over Vienna. Enjoy a drink at the bar before heading out to explore the fantastic restaurants and hip bars that litter this area. City Style - An achingly cool rooftop bar acts as the heart and sole of this hip bolthole, augmented by sleek modern rooms. Sights nearby - Just a 15 minute walk from the Hofburg and the Spanish Riding School. Local markets - Ten minutes from the Naschmarkt, an excellent food market in Vienna. 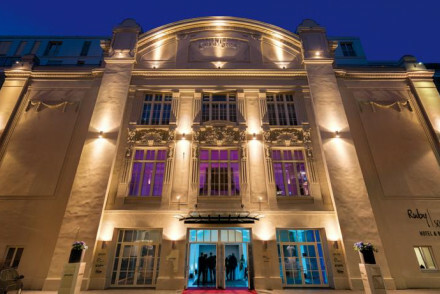 Excellent city centre hotel set in a former concert hall. Keeping with its original exterior, its interior has had a modern makeover with urbane rooms and a hip bar. Ideally placed for exploring Vienna's wealth of culture and history. Local markets - Twenty minutes from Naschmarkt, an excellent local food market. Sights nearby - 15 minutes walk from St Stephen's Dome and Karlsplatz. 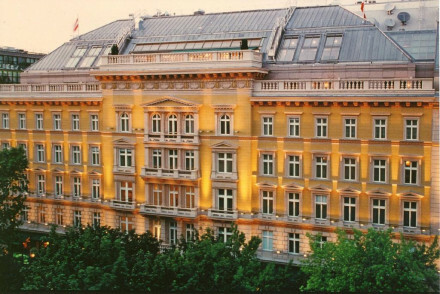 Hotel am Brillantengrund is situated in a Biedermer-style building in Vienna's 7th district. It offers shabby chic accommodation with plenty of vintage furniture and the restaurant specialises in Philippine specialities. Relax with a drink in the courtyard under the palm trees! A charming city stay. A lovely bright hotel with classical elegance. Airy rooms and suites in ice blues and white with elegant furniture and pretty paintings. Library filled with oil paintings and antique furniture. A crisp hotel in a great location. A charming family run pension with impeccable service in a good central location. Cosy and relaxed, with charming 19th century atmosphere. Lavish breakfast spread. An ideal base for exploring the city. Local exploring - A historic property located in the heart of Vienna within walking distance of the main sights. Sights nearby - Just a short walk from Saint Stephen's Cathedral, Hofburg Palace and the Spanish Riding School. 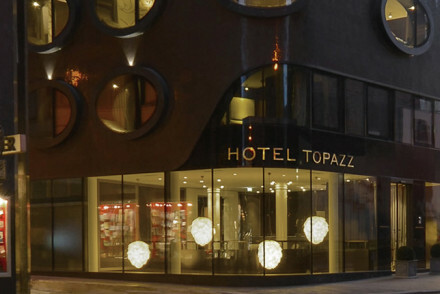 Quirky, contemporary, playful hotel. Contemporary bedrooms have funky wall murals, light wood floors and private balconies. A large sitting room or study area, restaurant and a lively bar. A young person's choice for fun in the city. A stunning boutique hotel in the city centre. A historic building with unique contemporary interiors. Enormous rooms and family suites have lots of natural light, sloping ceilings, and big bath tubs. City style for couples and families. Quirky - The theme that runs through the hotel is wine! Everything hints at wine, from the room products to the shape of your plate! Traditional - A traditional house with wonderfully modern interiors. A chic contemporary renovation of century-old house, in the heart of Vienna. Elegant interiors by top local designers, meet stunning works by renowned artists and original features such as the wrought-iron lift door. The helpful staff and small but lovely spa complete the picture. Local exploring - Ideally situated for making the most of Vienna, everything is within walking distance, and the staff are full of advice. City Style - A stylish choice with interiors by Wittmann, Backhausen and Thonet, Prosecco breakfast and private spa! Great walks - This section of the city has recently been pedestrianised making it the ideal for exploring on foot. Local markets - The Museums Quartier (MQ) is right across the road and is packed with eateries, museums and shops. Behind a traditional facade sit contemporary designed spaces with Air, Fire, Water, and Earth themes. Modern bedrooms and suites in browns, creams and oranges. Excellent restaurant and large terrace, gym, and wellness. Ideal for large groups or weddings. Local markets - A stone's throw from Rathausplatz which hosts Vienna's Christmas Market and much more. 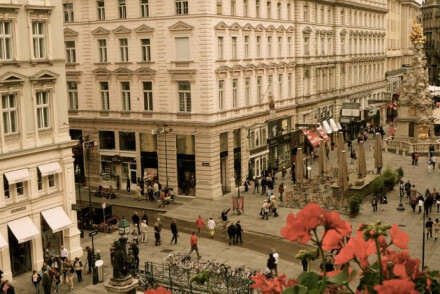 The traditional Hotel Beethoven is fantastically located in Vienna's cultural corner. 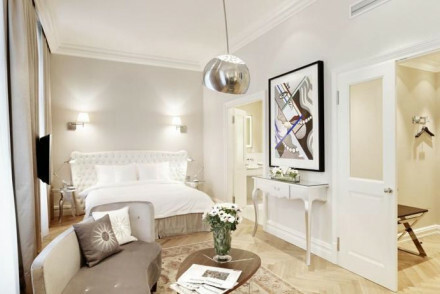 Charming rooms with parquet floors and big white beds. Sweet bistro 'Ludwig' and open plan sitting room. A typically Viennese gem. Value chic - Lovely traditional accommodation, in a top location at a great price-what more could you ask for? Short fly break - Located just ten minutes away from Vienna International Airport! A Family-run pension with character and traditional charm. The rooms are airy with large windows, antique style furniture and polished parquet floors. The great locality and reasonable price makes this the ideal base for a Viennese adventure. Local exploring - Right in the thick of Vienna's premier cultural district, perfect for exploring on foot or two wheels. Sights nearby - Saint Stephens Cathedral is within a 5 minute walk and well worth checking out. 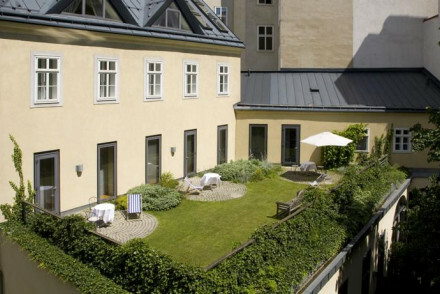 A chic boutique property in the centre of Vienna yet boasting a quiet garden location. Smart rooms are simply designed with pine furniture, whitewashed walls and large sash windows. 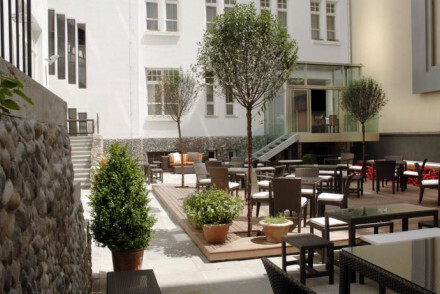 A central courtyard is the perfect spot to unwind with a regional tipple. The ideal inner city hideaway. Local exploring - Well located for easy access to many of the city's main attractions. Sights nearby - Be sure not to miss the impressive Baroque Schonbrunn Palace. A thoroughly contemporary hotel encased in a traditional shell. Each room is entirely unique and individually designed by designers and architects. The owner's adorned the walls with contemporary art including Warhole's and Prachensky's. The food is excellent and locally inspired. A chic option. Romantic Break - Couples should pick one of the Boudoir-inspired suites- decked out with mural-sized photographic nudes and sultry red velvet. City Style - A renovated townhouse nestled in the arty district of Spittelberg, with chic modern interiors. Great walks - Get out and explore the hip young district of Spittelberg on foot. A stylish modern boutique hotel in a converted townhouse. Rooms are minimalistic with quirky features. Think bathrooms found in cupboards. The owner is a professional chef so expect to dine well. The location is central and the rates affordable. An excellent find. City Style - Nestled in a quiet quarter of the old city centre, full of character and charm with orginal artwork and quirky details. Sights nearby - The nearby Hofburg Palace complex houses the National Library and the Presidential Office amongst other sites. 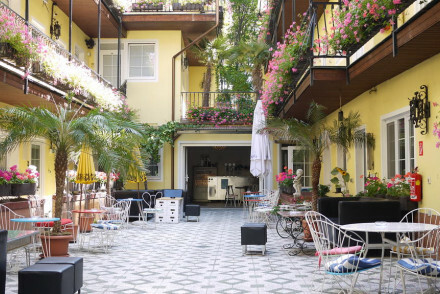 16th-century building transformed into a classical hotel with charming traditional style. Large rooms, antiques, plenty of atmosphere in central position. Good value. Sights nearby - Only 50 m away from the beautiful Saint Stephen's Cathedral. 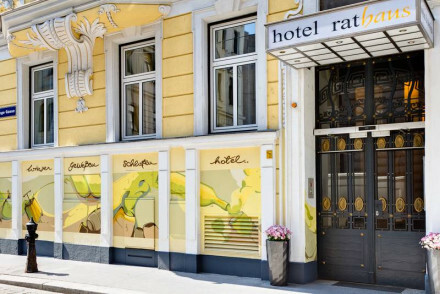 A stylish contemporary hotel in the heart of Vienna's art district. Slick modern design with traditional, exceptional service. Beautiful breakfasts and bar and state of the art spa. This five star hotel is perfect for romantics and art lovers. Sumptous 5* hotel in city centre. Interiors have stunning views from full length windows, enormous dark marble bathrooms and luxurious fabrics. Roof terrace for panoramic cocktails. Restaurant offers Austrian specialities in glamorous dining room. Romantic, intimate and superb location. City Style - Antique furnishings, rainfall showers, trendy bars and extensive wine cellar- right in the centre of the city. Total relaxation - Revive with unique spa treatments, plush bedding and warm attentive service, you won't want to leave! Sights nearby - Vienna State Opera is around the corner, be sure to check out what is on during your stay. A Conran-designed boutique hotel. The minimalist design has striking architectural features. Rooms are simple, crisp and clean with state of the art mod cons. Excellent Italian cuisine is on offer. Placed in the trendy Fourth district makes this one ideal for a city break. City Style - Individully styled rooms with furnishings by Philippe Starck, Wittmann, and Minotti achieve effortless elegance and style. Foodies - Enjoy award winning cuisine in the inner courtyard garden, mouthwatering Italian flavours crafted from local produce. Sights nearby - The fourth district holds St Charles's Church with the Karlsplatz Square which has an enchanting Christmas market. Local markets - A short walk from the famous Naschmarkt, a haven for foodlovers. An exquisite Five Star hotel. 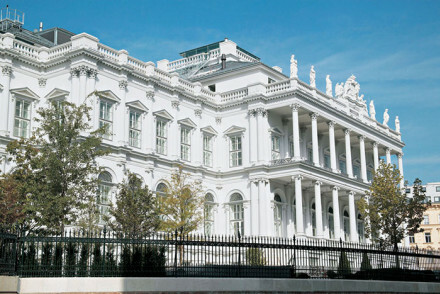 A traditional neoclassical facade encases modern architecture and contemporary comforts at the highest level. 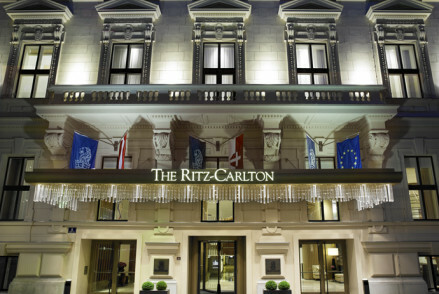 Beautiful rooms and suites, Michelin starred restaurant, lively bars, and a state of the art spa. A great choice for the luxury traveller. Spa breaks - Sate of the art spa. 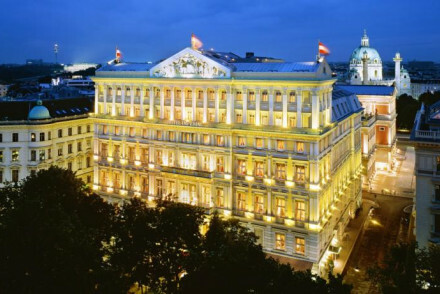 This luxurious five star is truly the Grand Dame of Vienna. The sumptuous rooms feature classic interiors, oozing elegance and opulence. The dining is second to none, with everything from traditional Viennese to Japanese. A one of a kind experience. Foodies - Foodie heaven from the traditional Japanese restaurant Unkai to the the Michelin-starred Le Ciel by Toni Mörwald. Total relaxation - With a sauna, steam bath and spa treatments plus relaxation zone and knockout cocktails its hard not to realax. 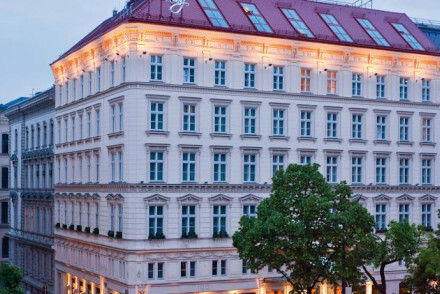 A stunning Five Star hotel with a neoclassical facade and mid-century modernist interiors. Palatial rooms and suites, Art Deco in style, with all the mod cons. 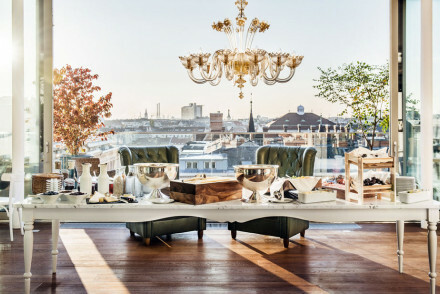 State of the art spa, excellent restaurants, and a roof top bar with panoramic views over Vienna's skyline. Roof terrace - Stunning views from the roof terrace bar. Foodies - Fantastic restaurant options. Old world charm and modern luxury. An 'institution' in the heart of Vienna. Chic white rooms with marble bathrooms and large sash windows. Ornate living rooms and restaurants are the place to be seen. An excellent concierge service. A spa with a wide range of treatments. Pure indulgence. Spa breaks - A luxurious spa using only the best products including including La Prairie, Ligne St. Barth and their unique Time to Chocolate. Sights nearby - Positioned opposite the State Opera and right next to the Kärntner Straße. Prince of Württemberg's Palace turned luxury hotel in 1873 offers grandeur, history and comfort. Massive rooms and suites are classic in style. Enjoy the award winning restaurant, the popular bar and the live music entertainment. With metres upon metres of marble, this is a truly majestic stay. Romantic Break - A truly spoiling stay, treat yourselves to champagne breakfast in the ballroom or private dinner in your sumptuous suite. 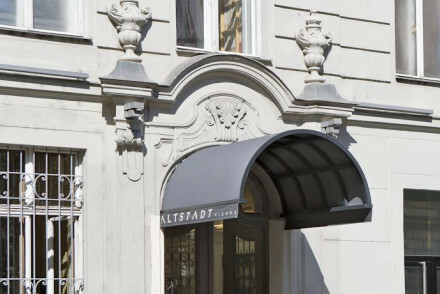 City Style - Location on the Ringstrasse, with suites adorned with chandeliers, swagged fabrics, orginal art and private butlers. 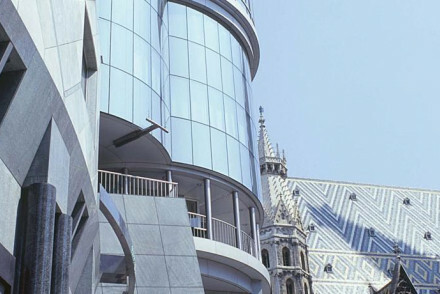 Sights nearby - Just down the road from the Vienna State Opera, the Hofburg Imperial Palace, and St. Stephen's Cathedral. Splendour and elegance in Five Star luxury. A grand hotel with magnificent suites, ballrooms, fantastic food, extensive spa and one of the best wine cellars in the world. For the luxury traveller. Foodies - Restaurant Silvio Nickol holds two Michelin stars.